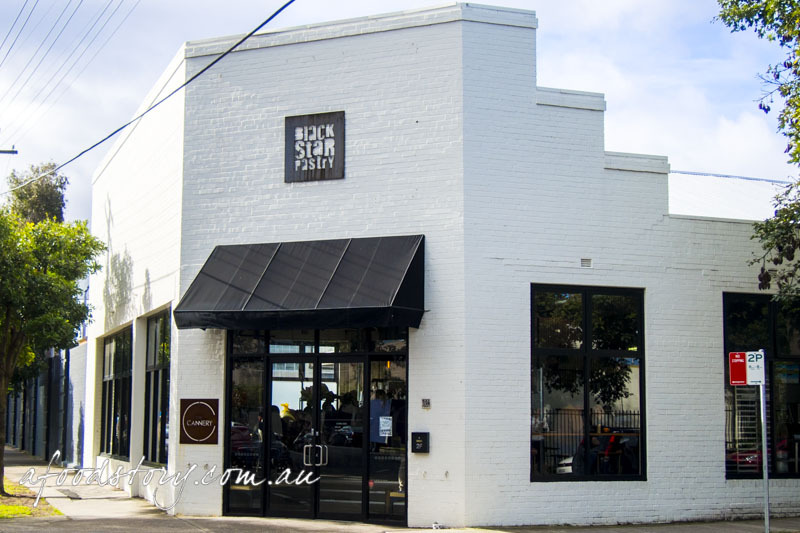 Black Star Pastry is no news to Sydneysiders. 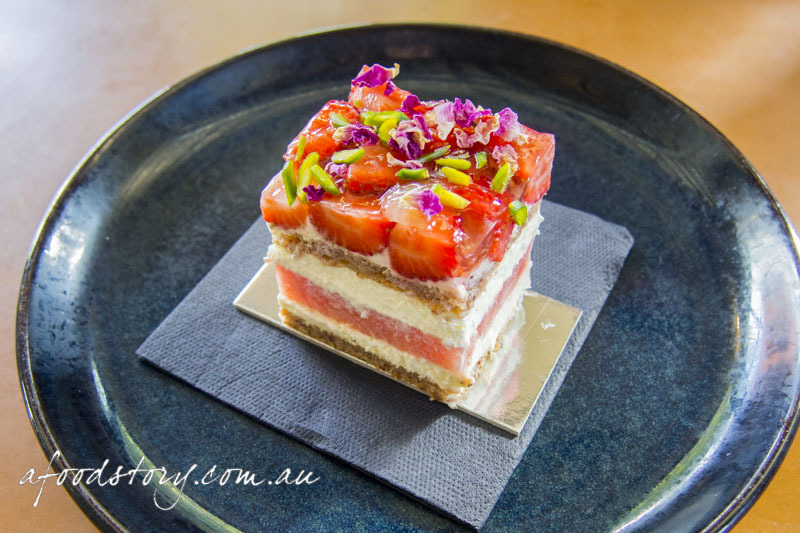 Their strawberry watermelon cake has got to be one of the most Intagrammed desserts in Sydney. But if you have been living under a rock for the last eight years then let me introduce you. 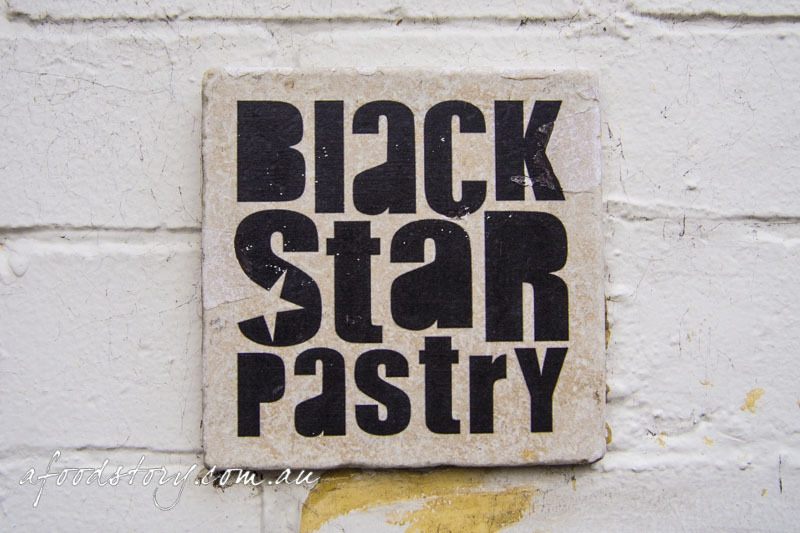 Christopher Thé is the brainchild behind Black Star Pastry, which he opened back in 2008 after years of experience in some of Sydney’s top kitchens. 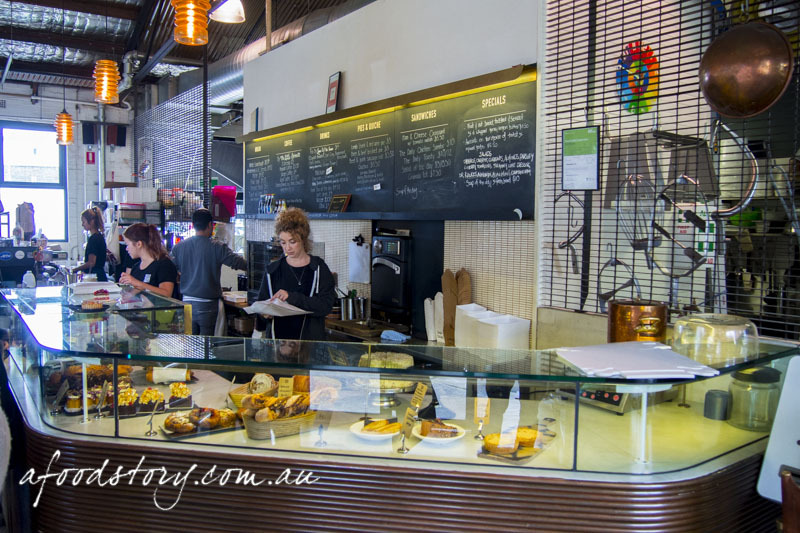 The cafe in Rosebery was positively jam-packed when we arrived and we were quite lucky to secure a table after only a short wait. The system is a little odd if you ask me. We had lined up at the counter to order only to be told there was table service. But on returning to our table we waited and waited and waited. Granted the cafe was busy but it took an age to be served. It would make more sense to us for orders to be placed at the counter (where you get to gander at all the desserts before ordering) and then food brought out to the tables. 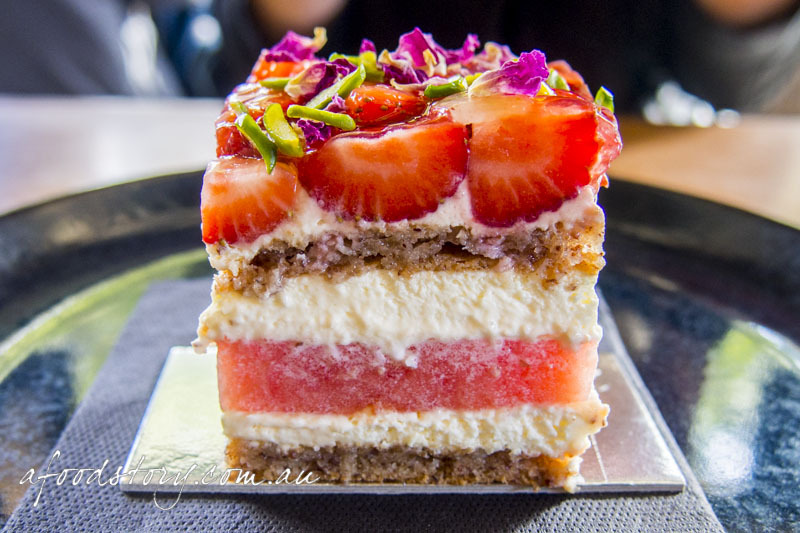 Strawberry and Watermelon Cake ($7.50). The infamous strawberry and watermelon cake! It is hard to resist and delightfully so. Layers of almond dacquoise, watermelon and rosewater cream, decorated with strawberries, pistachio slivers and rose petals. I’m unsure if it’s the slightly crisp, refreshing watermelon or the freshly whipped cream, but there is just something about the combination that makes this cake greater than the sum of its parts. It’s so light and delicate you could eat it all year round. And it’s a taste sensation. A beautiful dessert and absolute masterpiece. Dylan chose a very Dylan style dessert with the salted caramel pannacotta. Served in a small plastic dessert cup the pannacotta wasn’t able to wobble on the plate like you would see in a restaurant but that didn’t take too much away. 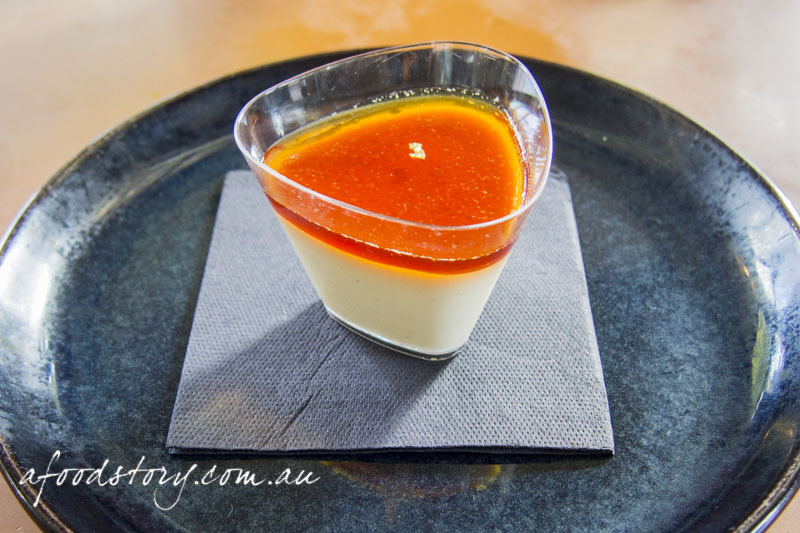 The set custard produced a wonderfully silky and light pannacotta, with visible flecks of vanilla bean throughout. Topped with a layer of lightly salted caramel jelly and gold leaf decoration for good measure. It’s not what I would call a salted caramel pannacotta as such but it is an enjoyable little pot nonetheless. Orange and Almond Cake with Persian Fig ($4.50). The strawberry watermelon cake was undoubtedly making an appearance but the difficulty lay in deciding what second dessert to order (because life would be boring if we only had one dessert each!) 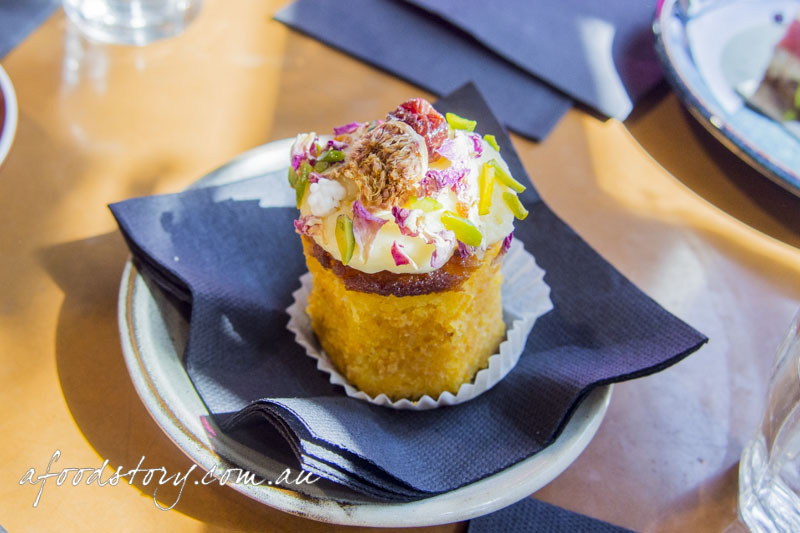 The final sweet treat to feature was an orange and almond cake with Persian fig. I’ve made a number of flourless orange cakes at home but using oranges from my garden I often find the cake a little too ‘wet’ and in need of more cooking time. Black Star’s flourless orange cake is fragrant and all importantly fluffy with a beautiful crumb not often seen in these types of cakes. Decorated with cream cheese icing, figs, pistachios and rose petals it’s another picturesque dessert that kicks goals in the flavour stakes. Although constantly crowded the quality of Black Star’s desserts makes it worth the wait, the money and definitely worth every single calorie. The fact that it’s located a short stroll from our favourite pizzeria makes for a dangerous combination. that orange and almond cake looks too pretty to eat!